With all of the big launch events behind us, the battle of the tablets has now begun in earnest. Apple’s iPad received an upgrade to the fourth-generation version in late October, alongside the release of the iPad mini. We also saw Google’s Nexus 10 tablet unleashed and Microsoft’s Surface tablet featuring the new operating system, Windows RT. Apple, as per usual, stole much of the hype from that week and has announced that its already sold 3 million of its new iPad releases (including the Mini). But at least one Apple fan is writing that he’s a convert to Microsoft’s Surface – at least in some situations. Patrick Moorhead writes on Tech.pinions that he’s stuck with Apple’s iPad since its first iteration, but now will sometimes leave it at home and take the Surface out. Microsoft’s Surface has won over at least one Apple fan. The overall gist of the post is that the Surface is able to handle more tasks that you’d usually do on a laptop. The Mail client is good at handling attachments and it’s easy to type out messages on the keyboard cover. The Web browser is the same desktop browser you’d use with other Windows PCs, meaning you’re not limited to mobile versions of sites. Yet it feels just as fast as a tablet browser. It doesn’t stop there, Moorhead also finds the Surface better for his blogging workflow, wireless printing, multi-tasking, and the fact a mouse is supported. What do you think? 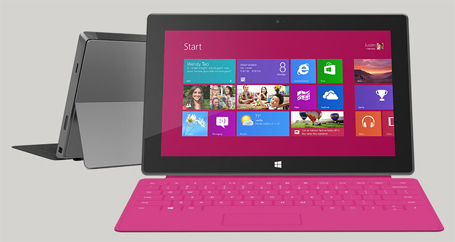 Are you an iPad die hard, or have you adopted the Surface tablet with good results? Let us know what your experience is in the comments section.